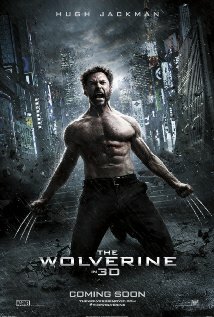 The Wolverine (2013), PG-13, 126 minutes - I've been sort of wishy-washy on this film for a few months now. The first Wolverine movie, 2009's X-Men Origins: Wolverine, in my mind, is easily one of the most underwhelming comic book movies made in recent years (Hugh Jackman's and Liev Schrieber's performances being the only bright spots). As a result, I almost dreaded the fact that this sequel was even announced. Then it was supposed to be directed by Darren Aronofsky and based upon Chris Claremont's and Frank Miller's seminal mini-series from 1982, and I got excited. Aronofsky dropped off the project and doubt crept back in. Finally James Mangold took over. He had previously directed Walk the Line and the 2007 remake of 3:10 to Yuma, both films that I enjoyed. The project was in capable hands, but there was still a certain level of speculation in my head. When I went to see The Wolverine yesterday afternoon, my mindset was probably the most neutral it has been for a comic book based movie in quite some time. Maybe my thoughts on the film are skewed because of that neutrality, but in my mind The Wolverine jumps towards the top of the list of sequels that are much better than their predecessors. Just to be clear, of all of the issues that I had with X-Men Origins: Wolverine, Hugh Jackman's continued portrayal of James 'Logan' Howlett (Wolverine) was not one of them. From his first appearance in 2000's X-Men, he's been a perfect fit for the character (other than being too tall, but that's neither here nor there at this point). He has been a constant strength of all of the X-Men related films and The Wolverine is no different. This may even be his best turn as one of the world's most popular comic book characters. The Wolverine focuses on a personal connection from Logan's past. He travels to Japan to fulfill the last wish of Yashida (Hal Yamanouchi), a Japanese technology tycoon who, as a Japanese soldier during the war, was shielded from the atomic bomb blast by Wolverine, saving his life. Yashida wants to do something to repay Logan before he dies. He says that he can make Logan mortal (his healing factor makes him virtually immortal). What Logan doesn't know is that Yashida has ulterior motives. Logan finds himself trying to protect Yashida's granddaughter Mariko while uncovering political and familial corruption. Jackman provides the best performance, but is supported by good performances from Tao Okamoto (Mariko), Rila Fukushima (Yukio), Hiroyuki Sanada (Shingen), Svetlana Khodchenkova (Viper), Brian Tee (Noburo), Will Yun Lee (Harada), and Yamanouchi. Mangold juggles and melds genres well in this film. Comic, thriller, horror, and Japanese crime influences are all noticeable and work well together. Also thrown in for good measure are a clan of ninja - not the easiest thing to do while keeping things believable (within the story being told of course, this is a comic based movie after all). I thoroughly enjoyed The Wolverine. It takes some liberties with the story that it is based on, but only to make it fit within the existing X-Men movie universe (one that has been building for 13 years now). I will warn you that it falls on the darker end of the PG-13 rating and more discretion should be used when taking kids than with the previous X-Men films. Considering how poorly the first Wolverine movie turned out, I'm beyond pleased with this installment. It isn't my favorite film of the summer, but it is easily the film that surprised me the most. - There is a mid-credits scene that ties The Wolverine into the overall X-Men film continuity, so be sure to stick around a few minutes for that. It leads into next year's X-Men: Days of Future Past, based on another classic X-Men tale by John Byrne and Chris Claremont from 1981. - After seeing the scene in the trailer in which Wolverine is seemingly flying, I was worried that we'd get a repeat of a misrepresentation of his abilities like in X-Men Origins: Wolverine when he super jumped off a hummer up to a helicopter before destroying it. Luckily, the full scene atop the bullet train played quite well in the actual film as opposed to the trailer. - I also worried about the use of Jean Grey based on the trailer. Her use worked well as she was used in dream sequences in an almost haunting way. Famke Janssen reprised her role as Jean Grey after being kill by Wolverine in X-Men: The Last Stand. - I liked the usage of Wolverine's bone claws, both prior to their being laced with adamantium and later after the Silver Samurai cut through them. - The Silver Samurai and Yukio are both portrayed differently than in the comics, but the tweaking works for the story being told so they doesn't bother me as much as some character changes in other movies have. - The Silver Samurai was very reminiscent of The Destroyer from Thor. - I liked that we get an 'Old Man Logan' look for a couple of minutes towards the end of the film (a well known Wolverine story from 2008 by Mark Millar and Steve McNiven.